A path of destruction lay in Santa’s wake. It From New York all the way to LA. The city of Lost Angels lay right in his sights. All of the naughtiest of cities lay in complete destruction and this was going to mark his last stop on the North American leg of this tour. The military had tried to stop him many times, but found their own tech useless against this master tinkerer. “These naughty boys and girls think they can stop me? Ha! Forget a lump of coal…you’re all getting a lump of lead!” bellowed Clause. As he draw closer, he could see the army getting ready to make a last stand as well. They surrounded the city with all they had. They would protect LA at all costs…too bad they wouldn’t be able to pay that cost. They centered all of their weapons on him and he on them. It wouldn’t be long before all hell would break loose. Both sides prepare to lay waste to one another, when out of no where…CRASH! A second sleigh slammed right into Santa’s. Santa grabbed his controls and straightened himself out. As he did this, the other sleigh come about. It was lead by three reindeer and one had a red nose. It was in shambles and covered in rust and scratched all to hell. The driver was head to toe in fur with two foot horns atop his head. With a snarl and a growl he reveal his sharp yellow teeth. It was the Krampus here to save the day. “Krampus!? What are you doing here! ?” asked a confused Saint Nick. “What the Hell do you think you are doing Kris? This is a mess! Have you lost your damn mind or something?” yelled the beastly demon. “I’m not going to listen to you! You’re just mad you never thought of this. Some enforcer you are. You stopped having my back years ago Kramp. Maybe if you would have stuck with it, things wouldn’t be as bad as they are!” Santa turned his eyes to the Hollywood sign. “This town will turn to ash, and you are going to watch it. “Now that’s what I’m talking about! Let’s make them pay Krampy!” Santa said while drawing a saber and pointing toward the city. Just as he was about to open fire though, a mass of rusty metal chains wrap round him and the sleigh. Clause spun around in shock. “I think you mistook me. You want me to enforce the naughty list? Hell here you go! You’re at the top of the list. 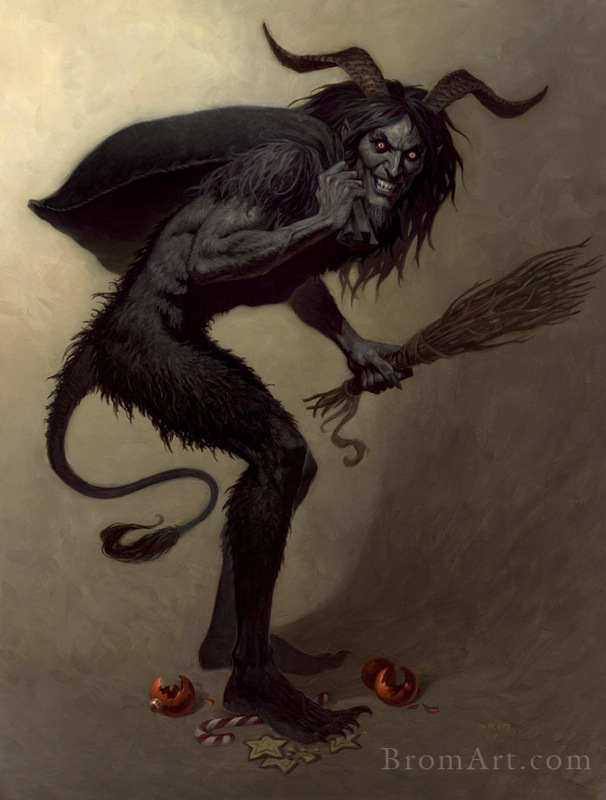 As bad as you’ve been…a trip to hell ought to do you some good.” With that, Krampus let out a roar. A hole opened up in the Earth and fire spewed forth. “This is for your own good Santa! Merry Christmas to all and to all a better night. Krampus flew down into the hole, and as quick as it appeared it was gone again. The military couldn’t believe what they saw. In fact no one could. Today would be the day….the day that the Krampus saved Christmas. This entry was posted on December 25, 2013 by malicepsychotik. It was filed under Tales from the Malcious Mansion, Uncategorized and was tagged with Chaos, Christmas, Krampus, Los Angeles, North Pole, Santa, St. Nick.